This blog was written several day ago, but due to a shortage of wi-fi connections, it’s been just sitting here marinating. And, of course, getting longer. Many of our supportive and well-intentioned friends and family have given us endorsements and recommendations for their favorite cities across America. We’ve been tagged in dozens–I mean, DOZENS–of Facebook posts of various lists of the most livable cities for creatives, the most affordable cities, the greatest small towns in America, the best places to live for outdoor enthusiasts or liberal progressives. If you can come up with a qualifier, there’s a HuffPo or Buzzfeed list, I promise you. We obviously had a few places we definitely wanted to visit as well. Bellingham, Bend,OR, Missoula and Madison all topped the lists. Bend has been the overwhelming frontrunner for most recommended city for the Beahans to visit. I was in a coffee shop in Bellingham a month ago and a woman launched into a long diatribe about how she and her partner waffled between moving to B-ham or Bend ten years prior (ultimately chose B-ham) but that Bend was a special place and not to be missed. Bend is a small city in Central Oregon at the foot of the Cascades and straddling the Deschutes River. It’s high desert here, and the climate is dry. It’s quite warm during the day, like 90+, but drops down into the high 40’s at night. Gorgeous. It was once the fastest growing real estate market in the country (so we hear) in part because it’s become highly desired spot to retire. AND. There are SO. MANY. BREWERIES. Which, for two people accompanied always by the mutt, it’s a paradise. Also because we love beer. It’s an outdoorsy person’s paradise–winter sports are just a few mile away, hiking is everywhere, mountain biking and rafting are unbeatable. I went for a three-mile run with Emmett yesterday and we struggled–partly due to altitude, partly to not being acclimated to the hot, dry weather and undoubtably magnified by the low air quality due to the forest fires wreaking havoc on the PNW right now (seriously, this is a side bar but if you haven’t heard, these fires are unreal right now). Anyway, as soon as we landed here we made plans to stay a few days. 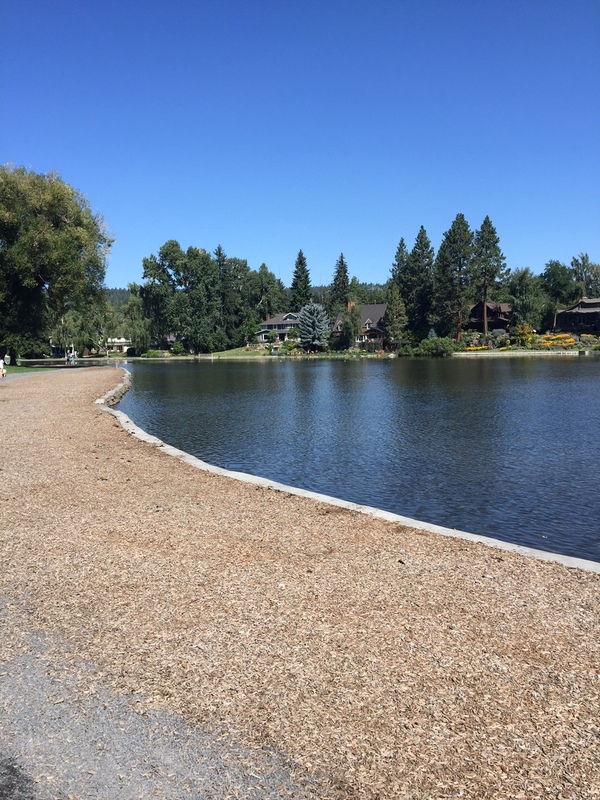 So, Bend is a nice place… but there are somethings else that has gotten in our craws. It’s disturbing that a city situated in the middle of sagebrush and red dirt can be so lush and green and manicured. As Mr. B said, if they apocalypse hit tomorrow, the land would reclaim all the REIs and Chicos stores in a matter of days. The golf courses and manicured lawns full of pots and flower beds brimming with geraniums and petunias, and the river banks lined with weeping willow trees–they’d all be consumed by the sagebrush and dirt. There is something inauthentic and troubling there. Bend–like many of the towns that folks have recommended–is a tourist destination. In order to cater to that economy, you nudge out the sagebrush, the red dirt and unsavory brown landscape and usher in a more pleasing, comfortable green lawn. See, you can have this awesome desert climate AND still have all the lush landscape that is so pleasing to the eye and foot. More troubling than the environmental impact–which, by the way, makes me shiver when I see all the recycling bins and “green Bend” signs–is the scene we witnessed last night. We had dinner, drank a nice rose, ate a mediocre ice cream sundae and then walked along the river. We stumbled upon a concert in the park. Two young (I’d guess no more than 21) blonde men were on stage rapping to a crowd of middle-aged (and when I say that I mean, older than me) white folks and a whole slew of kids and dogs. That right there was off-putting to say the least. I am not going to articulate this well, but it felt uncomfortable, nay, alarming to me that when I looked around the crowd, there was only one non-white face. But more disturbing were the lyrics that these young men were singing. Now, I do not profess to be at all up to date on what the kids are listening to these days. I barely know who Taylor Swift is. So, perhaps they were performing someone else’s song as an homage–but I’m not sure that’s better. But the words out of their mouths made my own jaw drop. “We’ve worked so hard only to have the doors slammed shut/landed out on the streets / despair and we turn the only way we know / we watch our friends go to jail…” on and on. I am really uncomfortable with this. I walked away because I didn’t know what else to do. No one else seemed even remotely bothered by what they saw which made me wonder if I was making too much of it. And then I thought, no. That’s exactly how this white privilege thing works. But I didn’t know how to speak up or to whom or how–so I’m writing it here. Examining the spectacle and my part in it. What it really makes me think about is why so many progressive, intelligent, racially conscious, environmentally friendly people want to live in this manmade oasis…this place that seems to have pushed anything brown outside the city limits? And so many of the places on these “best places to live” are the same way. They are enclaves. The Sechelts, the Breckenridges, the Jackson Holes and Bends (and I wonder what Austin and Asheville and some of the other places are like–I legitimately have no idea) of the worlds are all populated and visited by white people with money. Where do the rest of the people live and work? Not the retirees or professors or tech workers or financial planners, but the plumbers, the teachers, the cooks and the retail store clerks? Where do the people who make $35,ooo a year live? Where do the faces that aren’t white reside? I would rather have a higher crime rate, a school system that doesn’t function as well, modest homes and apartment buildings instead of huge intricately painted craftsman homes, or lawns that aren’t always green if I can have a community that reflects the roundness and fullness that reflects the more than just what the money will buy. I’m not articulating this very well and I am sure I am breaking all sorts of rules with regards to how to speak about race and socio-economic issues. But someone asked on Facebook a few weeks ago about what defines a community and since we’re on the hunt for just that, I have given it a lot of thought. This is making me rethink some of the places we are visiting. I am not the only one asking these questions, clearly. This Outside Online article just scratched the surface of a question that’s nagging at many people. As we drove through southern Oregon and Northern California’s blighted small towns, something else happened. I could feel my own mood take a rather rapid nosedive. After my dog snapped at a person walking down the street in some town in far Northern Cal, I found myself reduced to tears. I couldn’t put my finger on why for a while, but I think (and I’m almost ashamed to say it) that the depressed communities we ate in, slept in, wandered through got to me. Why ashamed? Because I want to be the person who helps bring vibrancy to a community, and I malign the fact that maybe I’m not. Clearly there is a balance to be struck between the overly tourist-centric cities and the forgotten, depressed towns. I’m looking.